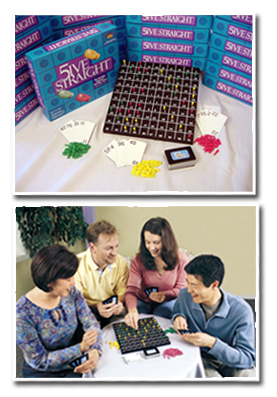 5ive Straight :: Play the exciting pegboard strategy game! Play continues until one team successfully places five pegs in adjacent squares in a straight line either vertically, horizontally or diagonally. Players of each team sit next to players of the opposing team. The pegs are distributed among the players, each team using a different color. The playing board is placed in the center of the table; and the dealer (selected by any mutually agreeable method) shuffles the cards and deals four to each player. The remainder of the deck is placed face down near the playing board. Players may look at their own cards, but should not show their cards to any other player. The player to the left of the dealer makes the first play. He must place a card face up on the table and put a peg in a square having the same or higher number than the number on the card. (A peg may never be put in a square having a lower number than that of the card played.) Play continues clockwise around the table until it returns to the first player. The first player now has the option of playing a card and placing a peg as he did previously, or picking a card from the deck. A turn consists of either: 1) playing a card and placing a peg, or 2) picking a card from the deck. All players have this option when they hold less than four cards. When a player holds the maximum of four cards, he must play a card and place a peg. Obviously, if a player holds no cards, he must pick from the deck. Once a card is played it may not be put back into play, but must remain face up in front of the player. Dead cards are possible. For example: if a player holds card number 92 and all numbers 92 through 99 have been pegged, 92 is a dead card. The next player holds card number 99, also a dead card. Don't reveal dead cards. If a player comes to hold four dead cards, he's out of the game and the game is over for all players. Players should refrain from comments or signals that aid their partners or distract their opponents. © 1968 Straight Line Products | © 5 Straight Products, Inc.